Ah Paris... Where to start? Probably the best place to start is with the fact that it became clear to me within the first half day in the city, that I could be here for a lifetime, and probably only begin to scratch the surface on what this amazing city has to offer. Of course, this makes trying to cram a weekend in even more daunting. 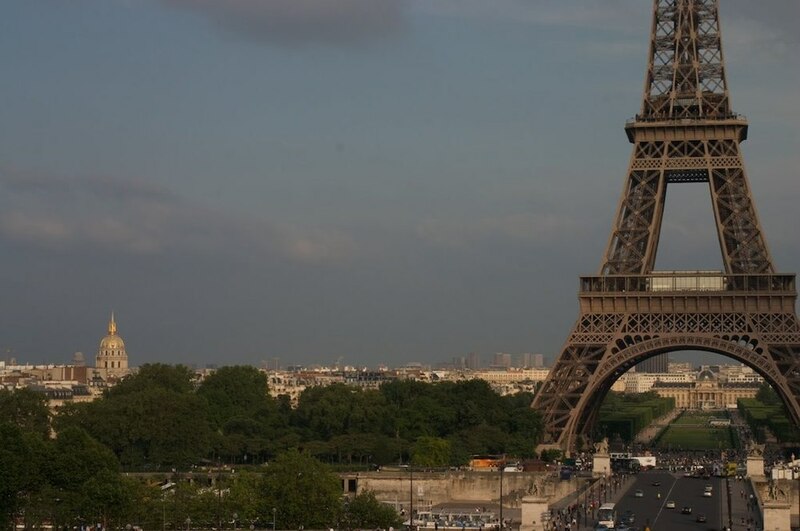 Back in 2001, on my very first trip to Europe, I made a conscious decision to avoid Paris on my free weekend. I went to Amsterdam instead, and have never regretted that decision. 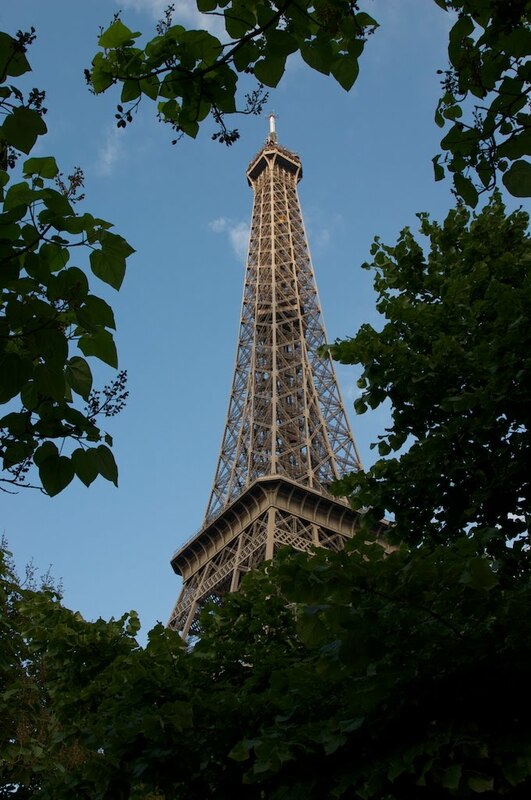 Now that I'm living in London, I think I'll have to tackle Paris in weekend-sized adventures. Ever since I got to London, I've been trying to get to Paris to see my niece, Alex. Sadly, its taken until now for our schedules to align. So I was fortunate enough to have a tour guide for my first weekend in Paris. My trip started on Friday with another trip on the Eurostar - I'm not convinced that the train is cheaper, but overall the experience is better, and it is very convenient. I was in Paris by 2:00, and checked into my hotel, and off to meet Alex by 3:00. The hotel was pretty good - fairly central location, and cheap enough. The room was small, as expected, but clean and well looked after. I had to wrestle my bags up the narrow, spiral staircase to the second floor, but once in everything was good. 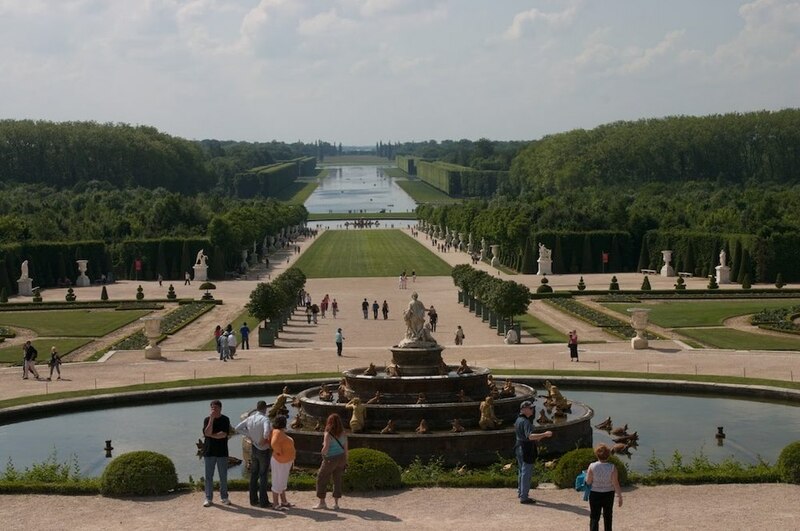 After settling in, I hoped back on the Metro, and headed out to Versailles to meet up with Alex. Alex lives and goes to school in Versailles, so this was a pretty good opportunity to see the Palace. We spent a couple of hours wandering through the Sun King's extravagance - the place is bloody huge, and I don't even know where to begin to describe it. We did the standard walk through the Palace - all the various bedrooms, the main halls, and some of the more impressive elements like the Hall of Mirrors. The extravagance of the place is mind-blowing - it’s not surprising that he almost bankrupt the country (how much money do you have to spend on your home to bankrupt a country!). The level of detail spent on the frescos covering the ceilings of every room is amazing; the sheer amount of gold leaf used in the place is staggering. As much as I'd like to try and describe it, words fall short. After doing the tour of the Palace we moved outside to wander the gardens. The gardens are equally amazing - perfectly manicured, laid out in exquisite detail, with lakes, mazes and "outdoor sitting rooms" all designed to amazing detail. It was a beautiful sunny day, and we spent a good amount of time enjoying it. After wandering the gardens, I was starving and we grabbed something to eat in a cafe near the train station. Alex got a kick out of the size of the "Grande" beer I ordered, and the meal was pretty good. Alex left me, not long after. I wandered around Versailles a bit longer, checking things out. The cathedral was pretty nice, and I spent a bit of time there taking some pictures. It was pushing into the evening - and a very beautiful one at that - by the time I got back to the hotel. I had a shower, and then headed back out for a bit of a stroll. I headed on the Metro, up to the Champs-Elysees. Rather than going directly there, I got off at the far end, and walked the full length. The Champs-Elysees itself is very impressive - a huge, grand boulevard, encompassed in park at one end, and opening onto the shopping insanity that is the main part of the street. And of course, at the "end", the Arc de Triomphe. The Arc de Triomphe looked amazing at night, illuminated. Part of my goal for the weekend had been to get some good night shorts of Paris. Sadly that didn't work out as it got very misty on Friday night, and it rained on me Saturday. Ah well, next time. It ended up being a pretty late night by the time I got to bed. Saturday morning was a pretty early start, as I was to meet Alex at 9:00. We started our day with a trip to the Eiffel Tower. I had pretty much decided early on that this trip was going to be "touristy", and the things Alex had picked for the day were perfect. Even though we got to the Eiffel Tower early, the line was huge! We chose to climb the stairs to the 2nd level, rather than brave the even bigger lines for the lifts. The walk up wasn't bad actually, and while the crowds were substantial, they were tolerable. The views from the 1st and 2nd levels were pretty amazing; but I didn't make it to the top this trip. The line there was huge and chaotic, and my lack of desire to deal with them made that something to do next time. 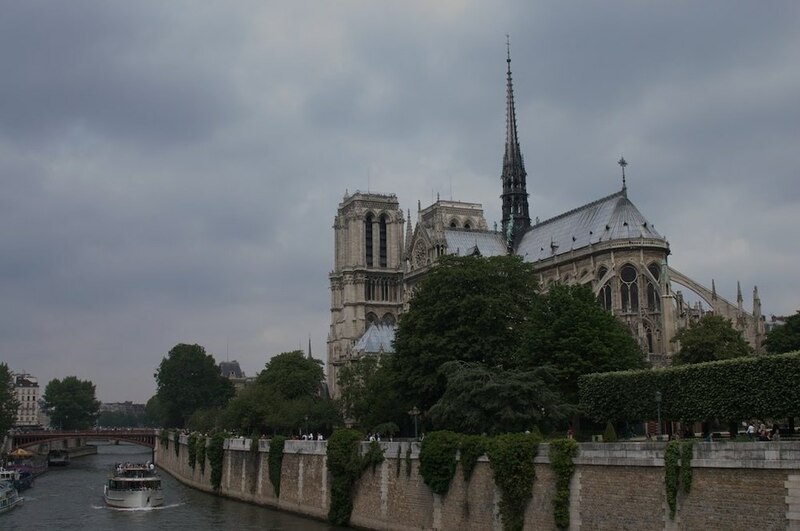 Next stop was a trip down-river to Notre-Dame. While there was no Hunchback, that was pretty much the only way that the cathedral disappointed. What an amazing structure. The crowds were a bit much, as expected, but given the sheer size of it, a pretty minor issue. We did a circumnavigation of the building, allowing me to check out all the different angles and take some pictures. It’s spectacular, no matter what angle you look at it from. I especially liked the huge (flying?) buttresses, and of course, the gargoyles. From the ground, they’re pretty hard to appreciate properly, and this trip I did not climb the stairs to the top (next time). Normally, I don’t bother with the inside of the churches, and given then lineup to try and squeeze into Notre-Dame, Alex and I took a pass again. As it turned out, I found myself drawn back to it a few times over the course of the weekend. Later that evening, as I was looking for someplace to have diner, I wandered by again. There was in essence no line, so I took advantage to go in. It was well worth it, even for someone as uninspired by the whole religious process as I am. The first thing I noticed were the acoustics – it just reverberated, with the smallest sounds from the front carrying, and echoing in the arched ceilings. It was absolutely awesome, and could just imagine how it must have inspired/intimidated the masses hundreds of years ago when first built. The interior is a marvel, and incredibly beautiful. The stained glass is wonderful, and all along the sides are alcoves (each with a different purpose I’m assuming) that are filled with various artifacts, paintings and stained glass. A lot of it was roped off, but I could imagine how spectacular it must be in the full light of day, with sunlight streaming in through those windows. I don’t think we spent that much time around Notre-Dame at that time. Enough to get a good look at it, but not too much. Next Alex took me for a bit of a walk through the Latin Quarter. At this point we needed some lunch. For lunch we found this nice little brasserie on a small side street, where I ordered chicken and got a hamburger. At least the burger was good. Our wanderings through the streets of the Latin Quarter eventually lead us back to a Metro stop where we again hopped on a train, but this time headed uptown. We started the afternoon with a trip to the Champs-Elysees and the Arc de Triomphe. Again, the weather wasn’t really behaving itself – it was a bit hazy and overcast, but we decided it was worth a trip up anyway. The Arc de Triomphe is surrounded by a huge traffic circle – a busy one at that – and necessitates a tunnel to get people over to it. It’s kind of cool actually – you pop up right under it almost. The structure itself it unreal – the detail that’s gone into the façade is incredible. This is especially true of the four amazing sculptures that adorn it. I think everyone is familiar with La Marseillaise, which must be one of the most recognizable images anywhere. 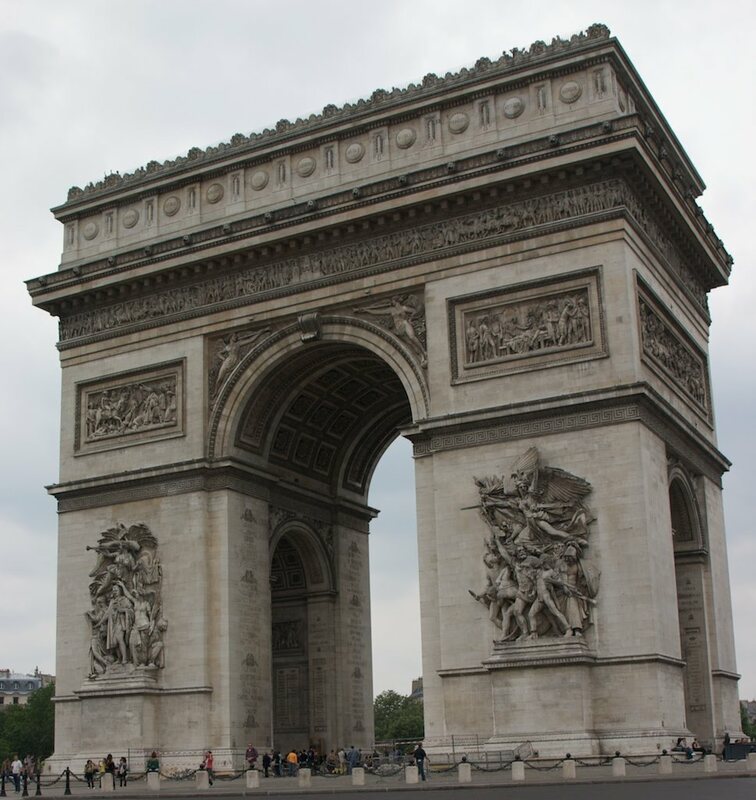 While the Arc de Triomphe was built as a monument to Napoleon’s victories, the addition of the pieces that speak to those that died in service in the Great Wars, gives a feeling of reverence about it. This is especially true of the Tomb of the Unknown Soldier, which is an especially moving part of the monument. We spent a little while taking it in, and then got into the queue for the hike up the stairs. Again this trip, I did a lot of walking, and climbed a lot of stairs! These were very narrow and spiral up to the top of the monument. There is a cool little exhibit on the building of the monument, on the floor just before the observation level. It was well worth a short stop to take in before heading up to the top. Despite the weather, the views were amazing, with a 360 degree view over the city. There’s a great view back to the Eiffel Tower, as well as you could see Sacre-Coeur off in the distance. I really liked the view down the Champs-Elysees. Far too soon, they threw us out of the gallery. Alex and I wandered a bit down the path along the Seine, but all too soon she abandoned me. Just kidding – she was an excellent host and tour guide, and it was great to finally get to see her in Paris. Hopefully there will be many more trips and I can see her there again in the near future. After going our separate ways, I headed back to the hotel and had a shower (OK, I’ll ‘fess up – and a nap…). At this point, the previously mentioned light rain rolled in, screwing up my plans for the evening. While it wasn’t enough to stop me going out, it was enough that I couldn’t take picture for fear of getting my camera wet. Instead, I wandered around Notre Dame and the Latin Quarter for a little while, before settling on a restaurant for dinner. I ended up at a Moroccan restaurant, and had an excellent meal, that lasted late enough for me to call it a night. I had plans for a fairly early start Sunday morning. Actually, it worked for the most part. It was complicated by the fact that the first Sunday of the month, entrance to the gallery is free. I got to one of the entrances (the one by the upside-down pyramid no less…) about 8:30. I was probably 100 people into the line up at that point, so my timing was good. By 9:00, you couldn’t see the end of the line – it was unreal. Promptly at 9:00, the doors opened and we all flooded in. I was a bit confused by the no ticket required thing, but I sorted through that and headed in. While I knew that the Louvre is the largest art museum in the world, it still doesn’t really prepare you for what that actually means. The scale of the place is enormous; I thought the Met in New York was huge, but the Louvre easily out-scales it. The plan was to try and stay ahead of the crowds and see the Mona Lisa before things got out of hand. And that worked, for the most part. There were still too many people there, but I was able to get to the front of the barrier and have a good look. It really is an incredible piece, even from far away. Between the barrier, the tinted glass (which they need – you wouldn’t believe all the idiots taking pictures with flash – come on, show some respect…) and the distance, I’ve had better “views” of it in art class, but it never top seeing the real deal. I didn’t stay long, and there were other pieces I wanted to see more – like da Vinci’s The Virgin of the Rocks, which may be my favorite Renaissance piece – which people were just streaming by, without even noticing. That’s part of the problem with the place – there’s just so much there, unless you have an educated eye, you don’t even know what you’re walking past. There were so many times that I’d catch something out of the corner of my eye, and walk back across the hall, and had just missed something major. I spent about 3 hours in total – and barely saw anything. I hit a lot of the major pieces I wanted to see the Venus de Milo, The Oath of the Horatii (David worked on such an incredible scale – his paintings are just huge…), The Raft of the Medusa, The Battle of San Romano (I have now see all three parts of this epic masterpiece, having visited the Uffizi and the National Gallery), and a whole slew of others from Raphael, Botticelli and the like. I also had a chance to see some of the sculpture galleries, and some of the very cool Egyptian (The Great Sphinx), Islamic (excellent mosaics) and Roman art. 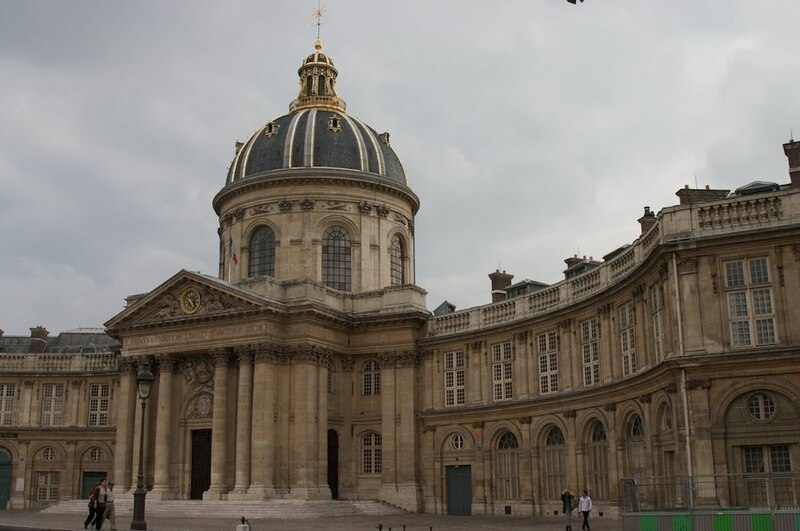 Actually, one of the coolest non-art things was the display of the original foundations of the first building that was the beginning of the Louvre – the original fortifications built in the 11th or 12th centuries. The discovered an excavated it in the 1980s, and have turned it into a very compelling display in the basement of one of the wings. Even so, in my three hours I barely scratched the surface, and missed so much – none of the Flemish art, Turner, El Greco – all of the decorative arts and tapestries. I could easily spend days and days wandering the galleries. Not to mention the rooms themselves. 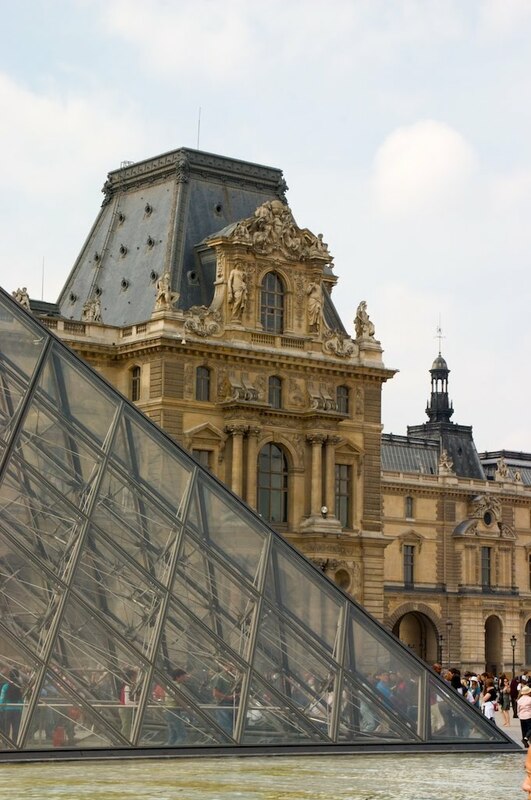 As the Louvre started life as a royal palace, the scale and artistry in the decorations of the rooms is stunning. My neck was getting sore from looking at the ceilings, doorways and other decorations. It is truly a unique and spectacular place. I will go back. Before leaving, I wandered back to where the Mona Lisa is, just to see how insane the crowds had become. My initial plan had been a good one, as you couldn’t get near the thing. It was getting close to noon, and sadly I had to head back to my hotel and check out. I exited through the amazing glass pyramid that sits in the courtyard amongst the main buildings – it really was a visionary idea to add it to the museum – stopping to take some pictures. To get back to the Metro, I wandered through the stunning Jardin des Tuileries, which of course lead to more pictures and me almost being late for check-out. After taking care of that bit of business, I had a few hours to kill in the afternoon. I headed out to do a walk through the Catacombs, which ended up being the coolest thing I did the whole trip! 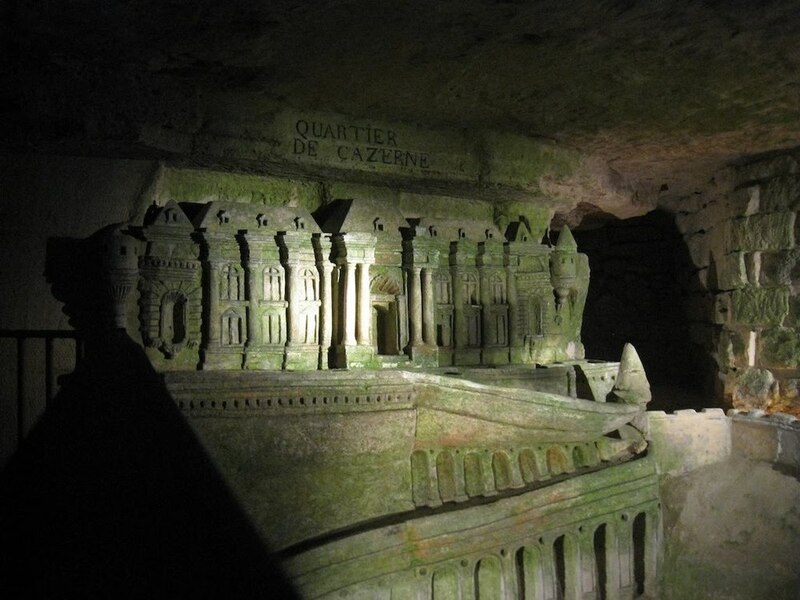 It seems that a lot of the suburbs of Paris were good for rock – granite, limestone and the like for building, and they did a lot of mining to remove the rock that went into building the city. Fair enough. It also left a lot of tunnels (which I am sure were also useful for other things like the Metro, but that’s just speculation on my part…). 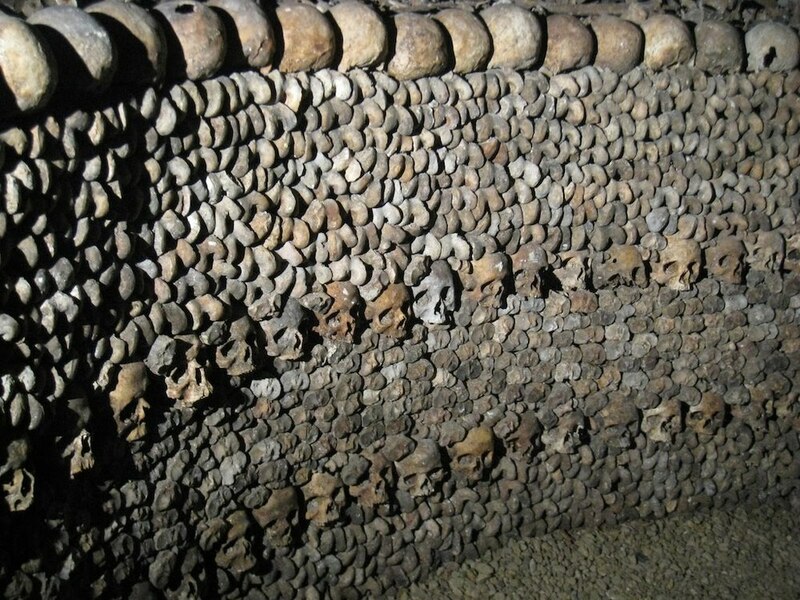 These particular tunnels got turned into a mass grave when they needed to move a number of cemeteries between the 1780s and the 1840s. One of the amazing sculptures created by the miners. After that experience, I ended up in a nice little neighborhood where I wandered for a bit, and had a drink on a terrace, and watched Paris go by. As I perused my guide book, I noted a flower market near Notre-Dame that had an interesting descriptor – “bird market on Sunday”. That I had to check out, and sure enough, there was a whole street lined with little shops, all selling birds and bird paraphernalia. There were some beautiful, exotic birds I had never seen before, along with people selling small mammals. There were two beautiful ferrets that would have come home with me if I was a little more stable, and the funniest thing was the cage of chipmunks being sold as pets! My afternoon ended a couple of hours later, after wandering around Notre-Dame again, then I did a short walking tour through the Latin Quarter that my guide book suggested (which was quite good). I hopped back on the Metro, back to the train station, then home. It was a fantastic weekend, it was really great to see Alex again. And I have come to the obvious conclusion that I need to go back to Paris for a much longer visit, to do it justice.